Nigeria (not to be confused with its similar sounding and similarly-troubled neighbor Niger) is experiencing more religious violence between Muslims and Christians. Since the unrest in Nigeria has yet to attain Third-World-Crisis-of-the-Moment status, it languishes in the doldrums of global anonymity. Lacking a Green Day song or an impassioned plea by George Clooney, the religious violence in Nigeria will likely go on unabated. An elderly woman prayed at the edge of the burial pit, chanting. “By God’s grace we will enter their villages and kill their women and children,” she repeated. 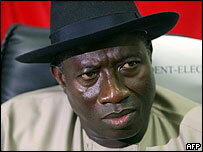 Adding to Nigeria’s sinister-quotient is the vice president (and current acting president), Goodluck Jonathan. Not only does Mr. Jonathan have the perfect name to be the arch-villain’s freakish henchman in a James Bond film, he’s got the right look, too. "No, Mr. Bond--I Expect You To Die"
Read About It Before U2 Sings About It: Village Massacres Shake Uneasy Nigeria – WSJ.com.